Senyorita Lakwachera: My Travel Treasures. My joy in travelling are very basic and simple, it is composed of experience, stories, and photographs and anything memorable. But most of all were photos, even when I was a kid I already had this joy in me of collecting photo and documenting details. I can clearly recall how I am used of writing details at the back of each photo I had from different places that I've been to. I have a lot of them that it makes it hard to manage when came into the point that I need to move from one place to another to make a living, oldest I have is a photo taken from General Santos City – marked when I was in grades 2 or 3. The word Janggas (spelled on my young thoughts) is how my aunts called General Santos that time - it is possibly the short for "DADIANGAS" from which Gen. San is also known of. For someone who only made up some reasons like school competition and church organizational activities (e.g. Youth Encounters and Catechism) just to travel, buying something isn’t really that easy especially for a self-supporting student like me – so all I can do is ask someone to take a photo of me as it is easier. This photo below was taken in Ilo-ilo City, it was in high school when I also visited General Santos City, Cagayan De Oro and Cebu just by attending to school competitions. Fast forward, comes the time when I already have a decent job to sustain my joy in traveling and yet I am not aware of blogging and even after my awareness of such way, I still collect photos and document stories. I'd buy big albums and create a scrapbook with hard copies of my photos (I am not sure how many still do this these days), stories like detailed time of arrival and some pamphlets and tickets. I'd send this album to my family in Kidapawan for two reasons. First is for them to be updated with my travel and know the great stories behind since up until now our home is not yet equipped with internet connection. Second is for my album, my memories and mementos to be taken good care of. I am well aware of that my mom will give great importance on my stuff like this as she knows how I sensitively value each of them. And this is how I did my first travel album and scrapbook created 2009. Apart from that I also have my growing collection of small stuff from any places which are mostly very affordable pieces that won't hurt my budget and handy not to add too much on my load. Keychains are my favorite travel collectables (small and affordable). In collecting Keychains I always do my very best to grab something that best represents the place's main product or culture. To add little detail here are my favorites. Durian Keychain from Davao City – this I believe is a real baby durian fruit, a fruit from which Davao City is widely known for. An Alternative Bamboo Water Storage Keychain – a small yet terribly cute one from Lake-Agco in Kidapawan City North Cotabato. I get my self off apprciating the aztec prints which representing the native clothing of Lumads. Guitar miniature straight from one of the famous Guitar Factory in Mactan Cebu – Alegre Guitar Factory. This mini guitar best represents not only Cebu's Guitar Industry but also to their finest craftmanship. 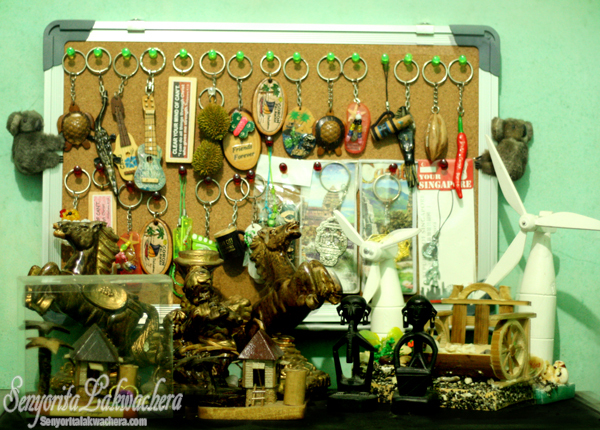 This mini souvenir is delicately cropted wiht Capiz shell. The Pili nuts and Siling Laboyo keychains – a combo representation of a place where Pili nuts and Spicy “Ginataan” dishes are a must eat – Daet Camarines Norte. Some other stuff I had are given to me by my friends who also travels, I’d love to keep and take good care of them as they will always inspire and reminds me of the places that are yet to be explored. Wrapping up, I hope I was able to share with you the great joy I had from my simple travel treasures. Theme: "Memorable Travel Souvenirs, Objects and Mementos"
Hosted by Jun Baris of Galangpusa. 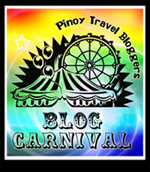 Check out the full collection of past carnivals.